Create Flavor Without the Fuss -- Cut your ingredient list by swapping out regular ground beef with Johnsonville's Italian Sausage. Johnsonville sausage is made with premium cuts of meat and already features a blend of spices for every appetite, whether spicy, sweet or mild. Swapping out beef for Italian sausage will add the perfect amount of flavor for any beef dish, while saving time in the kitchen since the meat is already blended with spices. Mix and Match -- Don't feel pressured to serve a formal sit-down meal. It's more fun to serve a variety of finger foods, small plates and quick nibbles, which also encourages your guests to mix and mingle. Small Touches Make a Big Impact -- Make sure your "spread" is share-worthy by using serving dishes in a variety of colors, heights and textures. Placing the dishes out on a serve-yourself noshing table surrounded by vintage holiday ornaments and fresh garland will turn your table into an Insta-worthy event. Get Organized -- To save time and cleanup the day of the party, prepare dishes such as cookies and other baked goodies the night before. Also, look for recipes with six or fewer ingredients to keep preparation to a minimum. These simple dishes will also be quick to replenish if supplies run out mid-party. 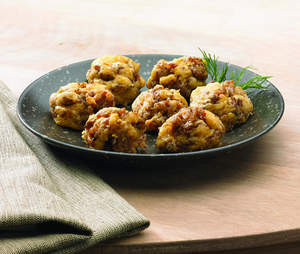 For additional easy holiday entertaining recipes and ideas, visit www.johnsonville.com and tag your photos @jvillesausage on Instagram to share a picture of your holiday gathering. And, remember to have a ball. In skillet, cook and crumble sausage over medium heat until no longer pink and lightly browned; drain. In large bowl, combine sausage, cheese, baking mix, onion, mushrooms and milk; mix well. Shape mixture into 36 walnut-size balls and place on greased, shallow baking dish. Bake at 350°F for 15-20 minutes or until lightly browned. Remove from oven and let rest 5 minutes before serving. Serve with barbeque or chutney sauce.